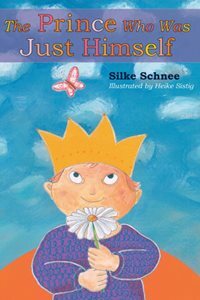 Silke Schnee does something absolutely fantastic in The Prince Who Was Just Himself that makes it a wonderful children's book that gives you goose bumps if you're an adult. The plot is about a royal family looking forward to their third child, Noah. The beauty of this story is that Noah isn't what every is one expects. Instead he is something beautiful. They start to notice that he is different. He is compassionate, he moves at a slower pace, he look at life a little differently than everyone else does and seems to take things in. However, Evil Scarface shows up and Noah saves the Kingdom! Prince Noah saves the Kingdom with his kindness and compassion. This book is more than just a book about compassion. It's about a boy who has Down Syndrome and the challenges children face. This sweet story will pull at your heart and will be a complete blessing to you and your family. It is a valuable teaching tool in your home or in the classroom to help aid discussion on Down Syndrome or developmental disabilities. copy for review. This is my honest review.